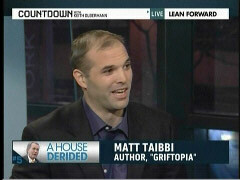 Appearing as a guest on Thursday's Countdown show on MSNBC, Matt Taibbi - contributing editor of Rolling Stone magazine - ridiculously accused Republican House Speaker John Boehner and Tea Party activists of racism in the form of using "coded language" to refer to "Mexican immigrants and non-white inner city, Democratic-leaning voters" as he responded to a soundbite of Boehner talking about having a social safety net for those unable to work, but that should perhaps exclude those who refuse to help themselves. It's amazing that he would say it so openly, but I know when I go to cover Tea Party events, I almost inevitably end up talking to people who are on Medicare or collecting unemployment insurance or government pensions, but they're railing against government welfare. I say, "Well, do you see any contradiction there?" "No, I deserve this. I work hard. It's those other people." And we know who they mean when they say "other people." It's Mexican immigrants and non-white, inner city, Democratic-leaning voters. So that's, it's coded language when he uses that kind of language. KEITH OLBERMANN: Mr. Boehner was also asked about his philosophy of governing, what the government should do for people. He said he believes in the social safety net, but then he gave a stunningly clear outline of who it is he thinks needs the social safety net. Despite figures showing more people are forced into bankruptcy by catastrophic medical costs than by anything else, Mr. Boehner thinks it's people who are unable to compete in the job market, and suggested there are Americans - he didn't identify whom - who will not compete. JOHN BOEHNER, HOUSE SPEAKER: I believe in the safety net. You know, we live in a competitive society. We live in a capitalist society. For those who can compete and do well, fine. Some Americans can't compete. I think we have a responsibility as a people to help those who can't compete. But do we have a responsibility to help those who won't compete? I would have serious doubts about that. OLBERMANN: A new Rolling Stone profile of Mr. Boehner chronicles his life on the dime of rich patrons, spending almost $83,000 on golfing in 2009, renting an apartment for years from a health insurance lobbyist, running up a $67,000 tab at the Ritz-Carlton Golf Resort in Naples, Florida. With us now, the author of that profile, Rolling Stone contributing editor Matt Taibbi, the author most recently of Griftopia: Bubble Machines, Vampire Squids, and the Long Con That is Breaking America. Good to see you, Matt. MATT TAIBBI: Good to see you, Keith. OLBERMANN: As I said before, I'm really beginning to like this guy. TAIBBI: He is going to be a lot of fun. OLBERMANN: But who are the Americans that can't compete versus the ones who won't compete? Do you have any insight into that? MATT TAIBBI: Yeah, absolutely, I mean, it's amazing that he would say it so openly, but I know when I go to cover Tea Party events, I almost inevitably end up talking to people who are on Medicare or collecting unemployment insurance or government pensions, but they're railing against government welfare. I say, "Well, do you see any contradiction there?" "No, I deserve this. I work hard. It's those other people." And we know who they mean when they say "other people." It's Mexican immigrants and non-white, inner city, Democratic-leaning voters. So that's, it's coded language when he uses that kind of language. But in Boehner's case, what's so funny about it, the people who can't compete, I think, in his eyes, if you go by his TARP vote, it's J.P. Morgan Chase and Goldman Sachs and Bank of America. I mean, those are the people he's talking about when he's talks about a social safety net, I think.